Please Note: Metal plate may interfere with wireless charging.Remove the metal plate before using a wireless charger.You may place the metal plate on your phone case, and just remove the phone case when you use a wireless charger. 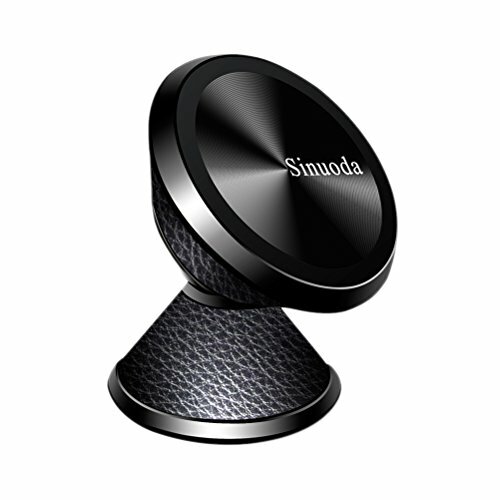 This Sinuoda magnetic car phone mount should be a nice choice for your car. 1.Clean and dry the back of the phone/phone case. 2.Stick a transparent protective film on your phone/phone case, and then stick the metal plate on the transparent protection film (press firmly 1-2 mins). 3.Please clean and dry the flat surface of the dashboard. 4.Stick the mount on the dashboard and press firmly 1-2 mins until fixed. And please wait at least 24 hours later before using it. 5.Please make sure the temperature of your dashboard is not high before sticking the mount or it may disable the adhesive tape. (For any adhesives included 3m brand company's one also will be melted and weakened its stickiness as parked in the direct sun for a long time. In that case, please replace the adhesive tape with extra one provided). 6.SPECIAL NOTICE: Never recommend to move the mount anymore once finishing the installation, if you really have to, please use a new adhesive tape. 7.If your device is larger like iPhone 7 plus 6 plus or others, to make sure the phone is held more securely, our suggestion is to use our larger round metal plate. 360°Adjustable Angle: 360°free rotation magnetic phone car mount allows you to rotate your Smartphone or swivel your display for your preferred position as you like. Strong magnetic: This magnetic car phone holder uses four neodymium magnets which provide a strong magnetic. It can hold the phone steadily even on bumpy roads. Safe Driving: Free your hands, make phone call and GPS more convenient with this magnetic phone holder. And it has a small body which will never cover your driving views. This phone car mount is just what you need if you want a safe driving! Widely compatibility: This magnet car phone mount holder is compatible with all size of 4-8 Inches Smartphones, such as iPhone 7/7 Plus, Samsung Galaxy,etc. Suitable for any flat surface: Multi-scene use magnetic phone car holder-you can applied to car dashboard, kitchen or desk surface, etc. When you attach this car mount on your dashboard or other place,please press firmly for 1-2 mins,and then wait at least 24 hours before using it. If you have any questions about this product by Sinuoda, contact us by completing and submitting the form below. If you are looking for a specif part number, please include it with your message.